All household water is chlorinated. Chlorine is a bleaching agent which bonds with and destroys the proteins in hair and skin. Hair can become dry, and sensitive skin can become itchy and irritated. Filtering both drinking and bathing water should be a priority if you suffer from skin disorders or chemical sensitivities. Enjoy a safe chlorine free shower, decrease stinging and burning eyes, reduce respiratory problems, lower the risk of disease, enjoy smoother softer skin, and reduce skin rashes, with less sinus irritation and healthier hair. 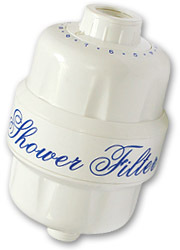 This shower filter uses a patented filtering medium called KDF 55. This 'golden sand' is made of a special high purity copper and zinc alloy. It effectively removes chlorine and other contaminants including iron, arsenic, mercury, dirt, sediment, odors. Enjoy smother softer skin, and reduce skin rashes, with less sinus irritation and healthier hair. Recent scientific research shows that for better health you should protect yourself from the harsh, toxic effects of free chlorine in your shower water. It is known that inhalation exposures may be up to 10 times as significant as ingestion or absorption, due to chemicals evaporating out of the water. Chlorine is also know to chemically bond to protein, leaving hair and skin dry and brittle, as well as eyes red and irritated.